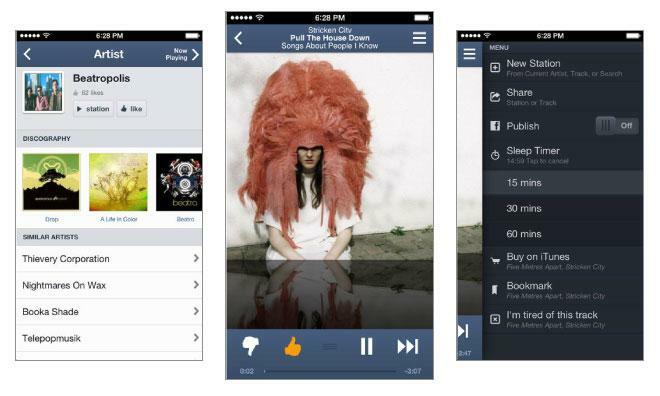 The latest update for Pandora brings the Internet radio service to version 5.0 on iOS. The update brings the ability to add variety to stations, view previous liked and disliked tracks, and to view track lyrics to the iPad, bringing that version to parity with the iPhone version of Pandora. Version 5.0 also has a redesigned interface meant to bring it in line with the flat aesthetic of iOS 7. Gone are the assorted textures and gradients that have marked previous versions, traded out instead for a minimalist look reflected even in the app's redesigned logo. The update also allows users to simply swipe to explore further tracks without interrupting the music. iPad users can also take advantage of a third pane, allowing them to find new artists and tracks. Version 5.0 of Pandora for iOS is available as a free download in the App Store. The 22.3MB download requires an iOS device running iOS 5.0 or later. Google, too, has updated part of the look of its Gmail app to better reflect the changes in iOS 7. The app now has an updated icon that is more in keeping with iOS 7's flat aesthetic. More importantly, Google has improved the attachment experience within the Gmail app. Users can now open larger image thumbnails into a full-screen viewing experience. The update also brings improved integration with Google's other iOS apps, continuing a trend Google has been pushing for some time now. Google Drive and Google+ links now open directly into their respective apps, keeping users tightly integrated within Google's micro-ecosystem on iOS. Users can disable this function in the in-app settings. Version 2.4.1 of Gmail for iOS is a free download in the App Store. It weighs in at 9.4MB, and requires a device running iOS 6.0 or later. Amazon has flattened version 4.0 of its Kindle app, bringing it into the new era of iOS design. The new Kindle app has a sharper look to it, carrying over many of the navigation cues that mark other aspects of iOS 7: thin fonts, thin lines, and so forth. Amazon has even adopted the translucency effects that mark Apple's Control Center and Notification Center menus. These effects, Amazon says, "keep constant connection between customers and their content." The update also includes the ability to organize Kindle content into collections with a few taps, as well as a number of slide-out menus in Library and Reader that combine key controls and are easily accessible. Version 4.0 of the Kindle app for iOS is a free, 19.7MB download available in the App Store. The download requires an iPhone, iPad, or iPod running iOS 6.0 or later.